Phase 1 of Operation Curtain is complete with a goal of covering only three windows—those that offer coyotes, bears, moose, Stellar jays, and humans an eye level view of me early morning and late night in an indoor habitat. To start, I I had to extract brackets and rods from packaging. And what’s up with all of that? I mean, protecting stuff from damage in shipment is one thing, but a curtain rod isn’t a controlled substance or an electronic device that has high street value for drug dealers. Next, lesson learned with house numbers, I organized the tape rule, carpenter’s pencil, drill, hollow wall anchors, hammer, screws, screw drivers, brackets, rods, curtain rings, and curtains (which I washed and ironed the week before) to minimize the number of times I went up and down the step ladder. That doesn’t even count as exercise, but I wanted to reach the Phase 1 goal as quickly as possible and get on to yard projects. I measured and re-measured, marked and remarked screw holes. Tedious, yes, but brackets and rods must be (Factor 1) exactly the same height from the ceiling; a (Factor 2) above the window opening so the rings and curtain header aren’t visible from the outside; and (Factor 3) positioned so the panels don’t end up looking like high-waters because they’re hanging too far off the floor. To determine which drill bit I needed to start holes for the hollow wall anchors, I began with the smallest bit and worked my way up. I couldn’t risk making a hole too big for the anchor, because, considering Factors 1, 2, and 3, there were no alternate options for bracket placement. And speaking of hollow wall anchors, I hate them. I smashed a few too many and had to drive to Spenard Builders Supply to buy more. I also regret very much that my electric screw driver won’t re-charge. I gave it to myself for Christmas in 2008 and was thrilled to use it, if only occasionally for a couple of years. During Operation Curtain, Phase 1, I felt a smidge of nostalgia for tradition, that old-fashioned division of labor into woman’s work and man’s work, Southern style. The woman sewed the curtains—I’ve done that. 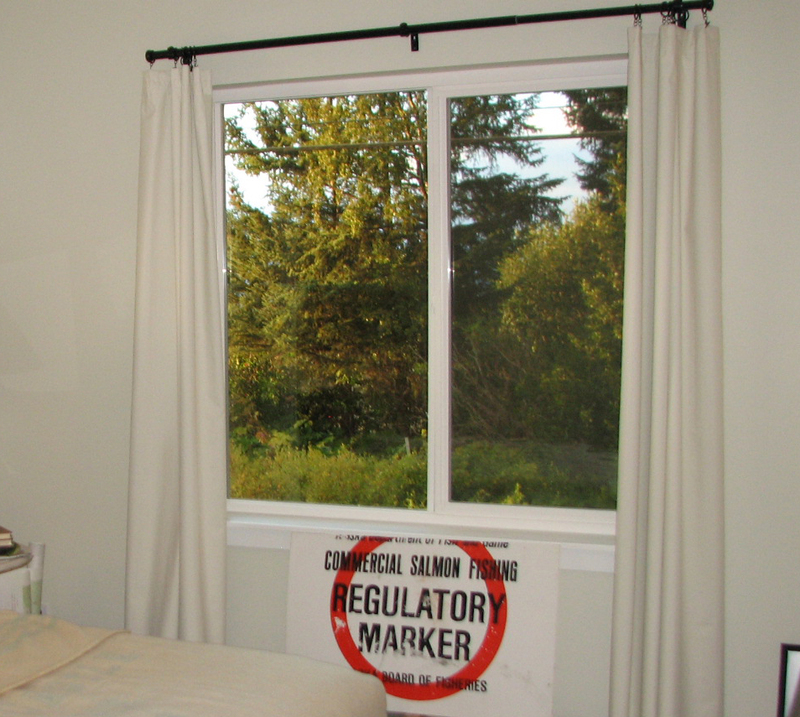 Or she procured them, either custom-made by a professional or ordered ready-made, like these from Country Curtains. I had them in my studio in Atlanta, then in the apartment where I spent the past year here in Homer. Installed by me both times. Traditionally, a man would be tasked with the installation segments of a window covering gig. And, while he may not have whistled while he worked, as the day progressed—a Saturday—he would have smelled the aromas from the kitchen where a woman cooked a hearty meat-and-potatoes dinner. Man, woman – I’m talking about the wife and the husband, or the living-together girlfriend and boyfriend. Here, it’s just me, flying solo since tradition flew out the window, so to speak, about six years ago. And I’m totally good with doing everything I can myself – within the limits of a woman’s upper body strength. Except for the dinners. These days, the woman here grills or roasts Alaska wild salmon and organic chicken and serves them with greens and roasted root vegetables. She concocts soups that tend toward French, Italian, or Mexican depending on the beans and spice that strike her fancy. It’s just that there are too many leftovers. I’m a fan of Edward Tufte, a statistician, political scientist, and pioneer in the field of data visualization. And through Dr. Tufte, I know of Charles Joseph Minard and his brilliant statistical graphic showing the losses Napoleon’s army suffered as they hobbled to and from Russian in the War of 1812. That’s historic, and this is nothing like that, but still . . .
Last week, I installed house numbers under one of the lights on my front porch. Neighbors, none of whom I know (yet), walked or drove by on their way to town and on their way back, with me still at work. Up the step ladder I went with a carpenter’s pencil from Spenard Builders Supply and a tape rule that retracts so fast it creates a breeze. I’m scared of it. Down I went for the drill, up again, down for the screw driver, then under the porch to pick up a screw that jumped from my hands and went overboard. Then up again I went. If I were a participant in a study of efficiency, the diagram of my movements would show lines tracing the same paths over and over again to create a dense, congested tangle of repetitive movements. Several lines would veer out from the central pattern. That’s when I went from porch to driveway to see how the numbers looked from a distance, went to the kitchen for a drink of water, checked e-mail, revised a brochure, made soup, ate soup. But number by number, the pattern would become less dense over time as I got in tune with drill and screw drivers. Temperature would not be a factor in the graphical display of my house numbers project. Not like it was in Minard’s graphic. But I am, still, taking a small place in the history of this very small town of Homer, AK. 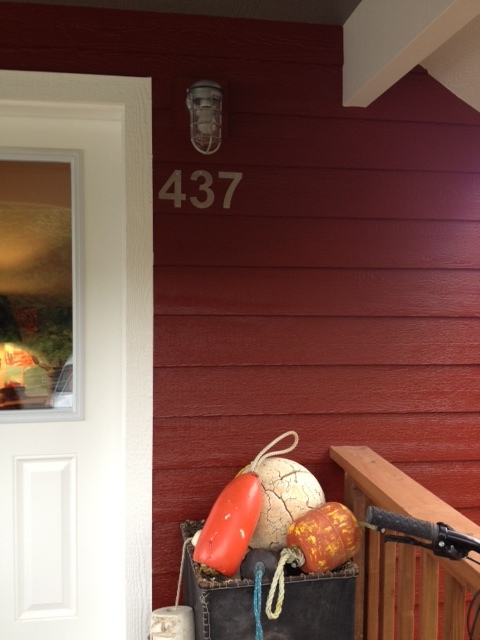 With its three new house numbers, 437 W. Fairview Avenue is the first residence in Homer to have natural gas service. Ya’ll, I am not kidding!